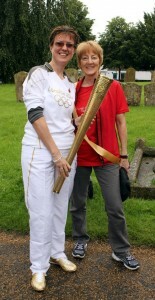 The Sports Centre took part in a hugely successful village Olympics day on Saturday 14th July. Alongside our activities events were held at St Mary’s Church, Burwell Print, Burwell Early Learners, the Library and the Baptist Church. 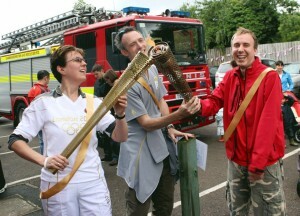 An Olympic Torch Relay pulled all the activities together, with ‘runners’ nominated for their contribution to village life. The relay ended at the Sports Centre with participants each receiving a medal for their effort. Three Sports Centre people were nominated and ran with the torch (a fabulous piece of kit made by N & G Marsh). Well done to Martin O’Leary, Steve Elmore and Jan Clay. The Sports Centre was fortunate to have Keren Goff, who ran in the real Olympic Torch Relay, attend the day with her amazing gold torch. Keren posed for dozens of photographs with our visitors and her attendance was a great attraction. Our day started with an energetic Jazzercise class and the fun continued on from then. Several of our instructors joined us during the day and we ran a variety of activities including trampoline, T’ai Chi, chair based exercise, multi sports, children’s races, football, badminton, table tennis and short tennis. Our Treasure Hunt was a great success thanks to the involvement of Burwell Print, the Parish Council, Burwell Library and Tina’s – all of which were a touchpoint for competitors. Several hundred people visited the Sports Centre during the day and we’ve had quite a few new people coming along to join our classes as a result. It was a brilliant opportunity to showcase what your local community sports centre has on offer and an opportunity to show that Burwellians really do have that amazing ‘Olympic spirit’. Our sincere thanks go to the instructors Sabrina Marenghi (chair based exercise), Faradena Afifi (T’ai Chi), Rebecca Nicholls (trampoline), Laurence Maskell and Dean Hilborn (All4Sports), Charlie Fryer (Baby Buggy Bootcamp) and Burwell Tigers. Huge thanks to Vaughan, Chris, Sue and Tony from Burwell Print who supplied the BBQ, photo machine and balloon race. Thanks also to staff and committee members who worked tirelessly throughout the day, setting up, overseeing activities and then tidying the place after we finally closed the doors. Steve Elmore, our operations manager, set the programme and oversaw the whole event – well done Steve.